The Royal Mail is to mark the Royal Shakespeare Company's 50th anniversary with a set of stamps featuring memorable productions and performances. 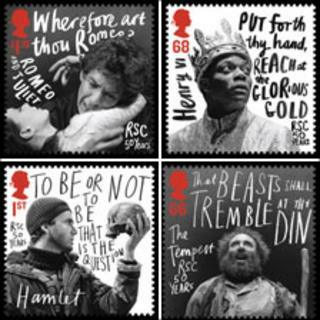 The 10 stamps feature defining scenes from RSC productions of Hamlet, The Tempest and other plays. Sir Patrick Stewart, Dame Judi Dench, David Tennant and the late Paul Scofield are among the actors depicted. Michael Boyd, the RSC's artistic director, said choosing the images had been "an almost impossible job". The stamps, he said, represented "the extraordinary range of work we have produced" since the RSC was founded by Sir Peter Hall in 1961. This month the RSC begins a year-long 50th birthday season of new productions, beginning with a new Macbeth to be directed by Boyd. The stamp issue coincides with news that Sir Peter is to direct two of Shakespeare's history plays this summer at the Theatre Royal Bath. The 80-year-old director has not directed Henry IV Parts I and II since he staged them as part of the RSC's Wars of the Roses cycle in the 1960s.